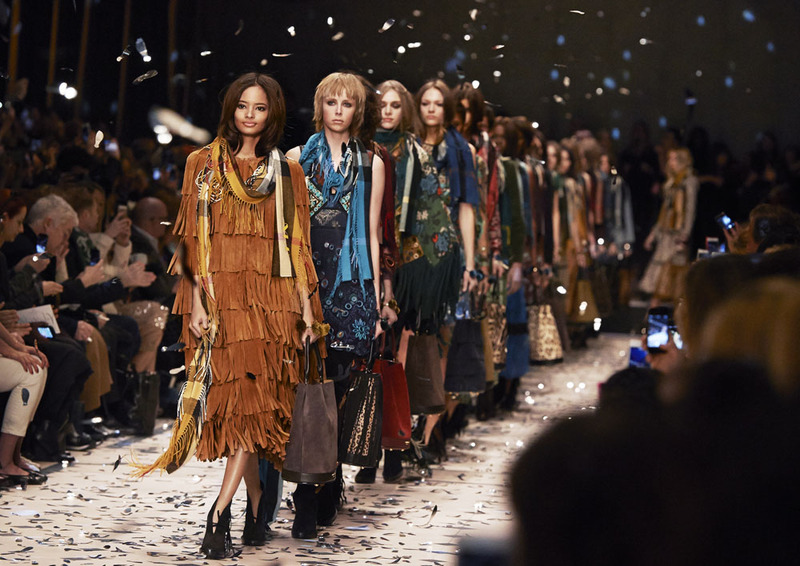 Like many designers this season,Christopher Bailey was inspired by the '70s boho vibe. There was plenty of floral and paisley prints and fringed suede coats on the Burberry catwalk.I don't mind a nod to the 70s with a floppy hat or some wide legged trousers but the full on fringing and ponchos were hideous. Does everything need to be fringed? At least the whole 90s thing is over, I lived through cropped tops and ugly shoes the first time around, I didn't want to see it again. Chokers and frosted lipstick can go and do one. Pat McGrath is easily the most accomplished makeup artist in the world right now. She’s worked with everyone from Alexander Wang to Gucci and in in demand all all the major fashion weeks. Her work is simply stunning but you can't really go walking down the high street trying to recreate this with a string of pears draped over your face can you? Givenchy's Autumn 2015 collection was showcased with loads of oversized faux facial piercings and jewels glued on to models faces. I don't think this trend will really catch on and I'm really not a fan of cultural appropriation so the kiss curls which are associated with chola style/subcultures used on the catwalk were rather annoying. It's like the bindi debacle all over again. While the catwalks of fashion week inspire a lot of trends, not everything that's shown on the runway will end up in store, thank God. I love fashion week for its extravagance, beauty and fun but I blame designers and high end fashion for the nonsense below. A faux suede fringed dress, no thanks. Holographic glam rock boots, I'd rather not. What are your thoughts on the A/W that were recently seen at LFW? Post written in partnership with 88 ladies. I wouldn't leave the house with pears or pearls! Not going to lie, I love those holographic boots! But I agree, there's a lot of very bizarre unwearbale fashion out there. It's the LFW 'street style' that drives me bonkers. Those people can't dress like that every day, surely? !